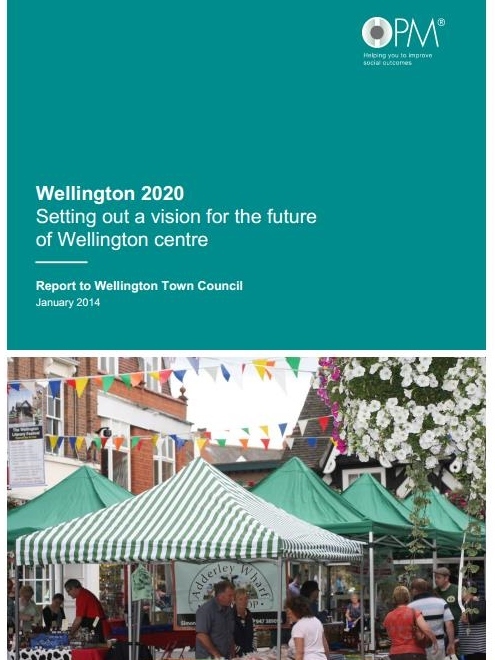 In late 2013 I was asked by the town council to draft a ‘vision’ for Wellington Centre – what could it reasonably expect to be like in the years ahead? And what practical steps could we take to get it there? For the first time I had the chance to put some real research time and deep thought into the town’s future and what we could do to make it work. An online survey provided some really interesting evidence of local people’s views about the town in relation to other places, a workshop gave people a chance to put their ideas forward on a range of themes, and national-level research into the future of retail in traditional town centres helped to put things into perspective. The report also considered what the potential impact of local changes could be – factors such as population increases, housing growth and the prospect of Southwater creating a new leisure time offer in Telford Centre. I presented the report to the town council a year ago – you can read it here – and over the course of 2014 they have been working behind the scenes to get Telford & Wrekin Council signed up to support them in turning it into a reality. Now, we begin 2015 with an experienced Telford & Wrekin economic development officer jointly appointed to support the Vision Report outputs, and a steering group to oversee and direct the work he’s doing. It’s encouraging. As part of this joint effort between the town and borough councils, £180k of funding has been earmarked from the Housing Development capital fund to help kick start some of those sites in the town where residential development makes most sense. 180k may be a drop in the ocean, but it’s a start – and importantly, it’s a sign of the borough council putting its money on the table. With T&W’s budget plans also announced and proposing new spending on supporting high streets and promoting the borough through events, we have even more reason to be positive. The thing is, I spend a lot of my working life trying to wean councils off their love for consultations and exhibitions. Don’t get me wrong, they have their place in the mix when it comes to engaging communities, but too often there’s not much mix to speak of and the engagement ends when the glossy display boards and flip charts are taken down. Because what’s the message we get from consultation events and exhibitions? We’re the council. We’ve been doing some stuff. We’ve got some plans. Come and look at them, then tell us what you think. Then we can go away again, make some tweaks, and implement our plans. Thank you and goodnight.’ It’s all very neat and tidy, but it’s not likely to build the involvement and capacity of local people in really meaningful, active ways. And without that groundswell of local involvement and action, the council just makes a rod for its own back – because in 2 years’ time, we’re not organising and networking and leading the change ourselves, we’re sat with our arms folded complaining that the council hasn’t done enough. Nobody wins. We should be excited that the borough council is so publicly backing this vision work. They have the power and financial resources to make big, strategic things happen, to overcome obstacles and drive progress. But that alone will not be enough. The vision set out in that 2013 report can’t all be boiled down into a council action plan, project managed on a spreadsheet. WE, the rest of us – residents, businesses, community groups – have to care and get stuck in. WE have to believe in that vision and start taking action ourselves. How can we help the best sorts of new businesses to get up and running? How can we support those who are already here? What can we do to motivate our friends to get excited and energised about our town and its prospects, rather than complaining that ‘it’s just charity shops’? WE have to be inventive. WE have to take inspiration from the homespun community stuff that’s already going on – the Peace Garden, the Walking Festival, the Clifton Project, the Midsummer Fayre. And that goes for the town’s businesses as well. Some of them love to criticise everything that anyone does in the town – the borough council, the town council, the chamber of commerce, the events which ‘take people’s attention off us’. Well maybe they could look around at what some of their more inventive neighbours are doing – the workshops run by Tink’s Treasure’s in their back room which make it more than just a shop; the Cider-Press Day and the tongue-in-cheek Pickled Onion Contest that are fast making The Pheasant Pub & Brewhouse into a real community hub; the expanding ambitions of Francis James (which currently operates two shop units) and the fantastic cookery classes that make the Mukaase Café a part time culinary school. These businesses all add interest, they create character, they make Wellington stand out. We need more of our independent businesses to think like these. 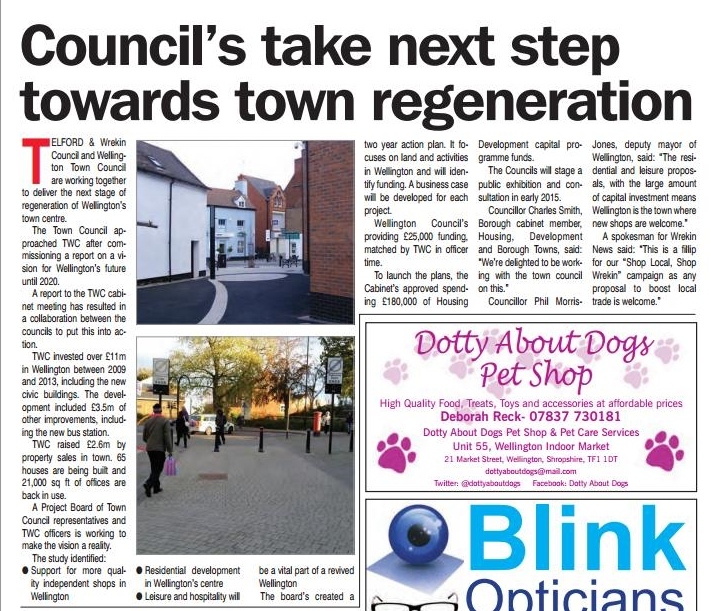 Because there’s a risk that if we just talk about ‘REGENERATION’ – like in the Wrekin News article – we make it sound like council business, reliant purely on funding streams and council officers and the comfort of organising monthly meetings with repeating agendas. 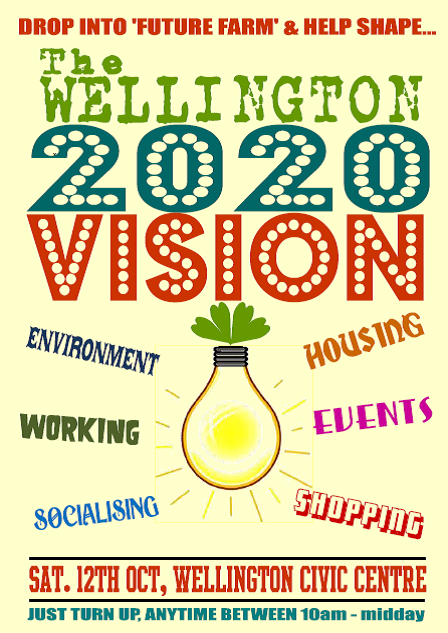 But let’s not think about a clinically ‘regenerated’ Wellington as our goal – let’s think about the things that would make it FEEL good to be in; a bustling town, a prospering town, a fun and interesting place. Communities and businesses need to own these ideas, these ambitions and some genuine actions themselves.